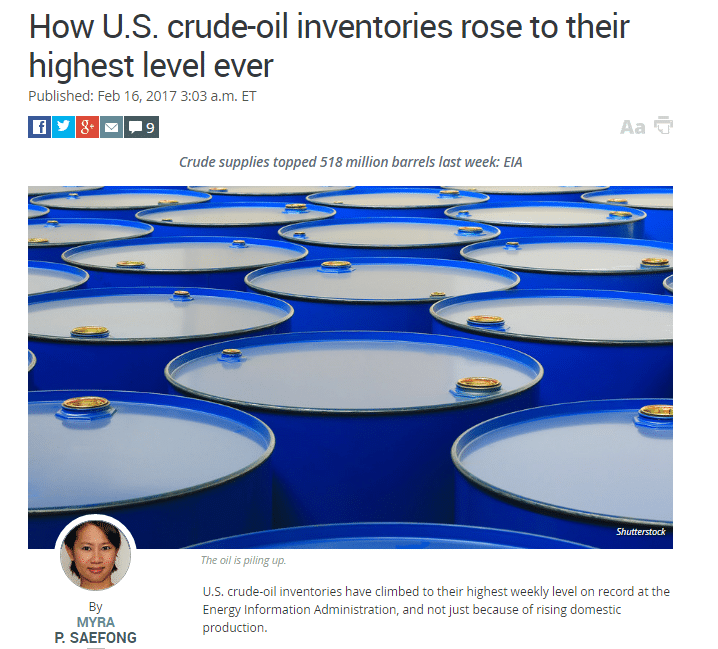 U.S. crude-oil inventories have climbed to their highest weekly level on record at the Energy Information Administration, and not just because of rising domestic production. A number of factors, including strong oil imports, higher exploration and production company spending, and a slowdown in demand have combined to lift total commercial crude stockpiles to 518.1 million barrels for the week ended Feb. 10, according to EIA data dating back to August 1982. That figure tops the former record of 512.095 million barrels for the week ended April 29, 2016. “The continued growth in the stocks of crude is due to higher production in U.S. shale plays and imports that exceed the volume needed by refiners,” said James Williams, energy economist at WTRG Economics. MarketWatch asked several analysts how stockpiles managed to reach an all-time high, even as domestic crude production currently stands at 8.977 million barrels a day—below the record peak output of 9.61 million last seen during the week ended June 5, 2015.